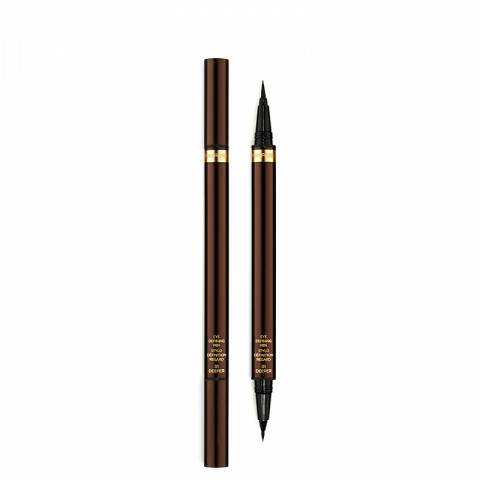 Complete the look of Tom Ford seductive eye with exceptional polish, using this innovative, dual-ended liquid liner. Formulated in the blackest shade of black, it delivers ultimate precision and makes fluid strokes easy to achieve. Featuring a fine calligraphy tip on one end and a brush on the other, creating a spectrum of transforming effects, from classic, sleek lines to dramatic wing tips of sultry doe eye. I am so far from being a pro at swoops and winged eyeliner, and yet it felt just completely natural with this product. Hooked. Waterproof and lasts all day but will easily come off with eye makeup remover (I use Lancome). the description of this eye liner is spot in. It's easy to control and gives a consistent line. Definitely waterproof. Doesn't budge until you remove it with makeup remover. I love how easy to use it is. It's similar to the new CPB liner which is equally amazing! Yes, it's expensive, but it's Tom Ford. You are getting a quality product. This liner lasts until you take it off. Very good quality. this seems pricey for eyeliner but you get 2 in one, so it is a great value. this does not smudge or flake or crease. lasts all day and since there are 2 ends you can choose which side to use for the thickness of your liner. a great tom ford product! I love that it has 2 ends, this way I can control the size of my line. It doesn't smudge or run. Its so easy to use. Love using this to make the perfect wing. It applies so smoothly and easily and lasts through the day. Tom Ford's Liquid eye defining pen is the bomb! I was introduced to it by Eric, at The Cos Bar in Aspen and I never want to use anything else. Its thick on one side and smaller on the other, which lets you get crisp lines. So for those who love their winged eye liner, like me, this is the perfect eye liner to use! & Its long lasting!